Steven and Juan Piñeiro were discovered By Dave Duncan in The 2009 Florida Bowl Riders Cup. After that, he invited them to continue the WCS tour... Both of them like to say that Dave Duncan is “like our God Father in SkateBoarding he introduced us to the big leagues! !” And in the big leagues theyare. Steven was sponsored by Embassy last year but just changed a couple of months ago (in August 2011) to Demon Seed. Juan was on the Amateur Combi Pool Classic roster but could’nt make it. A couple of days before the Bowl-A-Rama contests in Wellington and Bondi, it was time to ask Steven again about the main thing in his life ”his wrist” LOL! isTia.tv: What happened to your wrist? Steven Pineiro: NO COMPRENDO!! LOL!! I believe you are referring to my brother Juan who broke his wrist last month. isTia.tv: When did he break it? Steven Pineiro: My brother Juan broke it about six weeks ago, was doing a back blunt to disaster on a 10' wall and paid the price. isTia.Tv: Did he have surgery? Steven Pineiro: No he did Not need surgery, however & ironically, it has helped Juan on improving & learning new tricks that requires the use of his left hand. isTia.Tv:Did he have a cast? Steven Pineiro: He had one, and for the record Juan is a beast he is skating harder than ever with his cast on Juan is amazing I learn so much from him I'm his biggest fan!! isTia.tv: Do you plan to break another bone before the Protec Combi? Steven Pineiro: Hopefully I won't break anything ever again. But skating on concrete you never know....on and at the level of tricks that I'm trying or doing, even with pads it's very dangerous. isTia.Tv: Are you going with the team? Steven Pineiro: No I'm going by myself this time. isTia.Tv: How did you prepare for that? 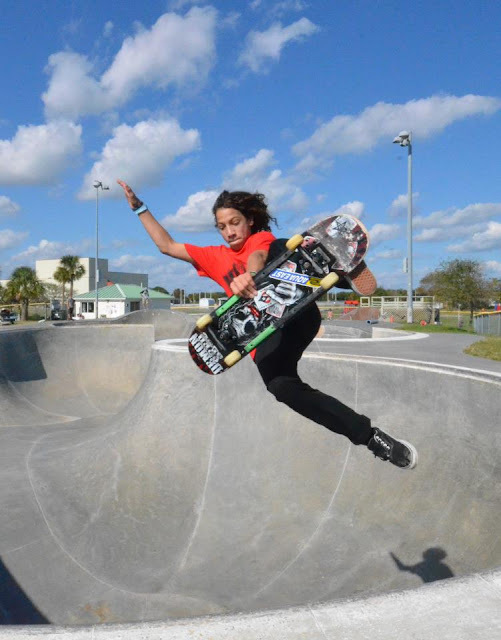 Steven Pineiro: I just do what I do every day, skate & have fun! isTia.Tv: What do you expect from the contest? Steven Piniero: To have a good time with my fans & friends, to deliver the best I can & put down all my newest tricks...all around to have a blast!!!! isTia: How are you doing with schoolwork? Steven Pineiro: I'm avoiding homeschooling. I believe in having a normal life as possible, so I'm negotiating work with my teachers and doing make-up work when I come back. isTia.Tv What's the story behind the awesome Penny clip (see above)? Are you sponsored by Penny? Steven Pineiro: Not exactly, I was skating at Atlantic Beach Rotary Skate Park one day and there was a boy who was riding a penny, I got some crazy ideas and asked if i could use it for a bit and it ended up being awesome, so my friend Connor Cornell filmed and put together the Penny Video and it came out soooo sick. his wrist a few weeks later. isTia.tv: What have you done in the past 3 months? Steven Pineiro: Actually I have been taking it kind of easy. I've been focusing more on different things not skateboarding related, like been a normal teenager in a public school. isTia.tv: What were the last three contest you did? Steven Pineiro: Georgia Bowl Riders last October, Tim Brauch Memorial before that & The Dew Tour last summer. It was an awesome experience. isTia.tv: What was your best contest of the year? Steven Pineiro: I have to say The Pro-Tec Pool Party because the level of skating was really high & I placed 7th among the best Pros in the world/industry. However, I really enjoy Georgia Bowl Riders I was very pleased with my skating. neither my circle of skating friends . Pretty stoke by it!! isTia.tv: What happened with Embassy? Steven Pineiro: Things weren't working out so we just moved on!! isTia.tv: When were you contacted by Demon Seed? Steven Pineiro: Shortly-After! isTia.tv: Why Demon Seed? 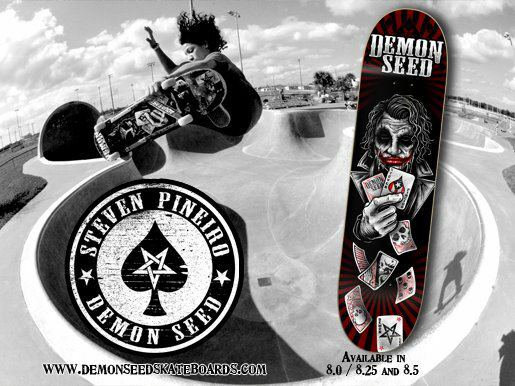 Steven Pineiro: We have been good & long time friends with Wade the owner of Demon Seed and The rest of DS mafia since we started skating. It was only natural to go with them because of the respect and good vibe they always bring & we have always skated together all over Florida anyways. Wade has always had an open invite for us to be part of The DS Mafia. isTia.tv: What did they do to welcome you? Steven Pineiro: They throw down a "WELCOME TO THE TEAM" Party. The whole Demon Seed team came up to JAX to Kona Skatepark along with some friends like old school legend Adam( SCISSOR) Effertz and many other we had a blast!!! isTia.tv: Tell me about your new board? Steven Pineiro: My Board is AWESOME!! I'm so happy about it!! Demon Seed did a great job producing it. By Keeping The evil theme of DS the concept is my face as a evil- joker pitching cards with all kind of DS logos, my name, Puerto Rican flag etc,etc. Is 100% made in America, dipped in black with the grafix on top, My own logo combined with Demon Seed's name on top of the line wood & good concave too... It really is good quality!! It selling very good. I couldn't be happier!!! isTia.tv: Tell me about the Demon seed party. I heard it was awesome? Steven Pineiro: It's the awesomest party ever!! Lots of people...way more than I expected, good friends, fans, family. they had a raffle, product toss, good music a DJ on the mic. Overall on of the best day I ever had!! I am so grateful to have all those guys there & celebrating with me!! ! 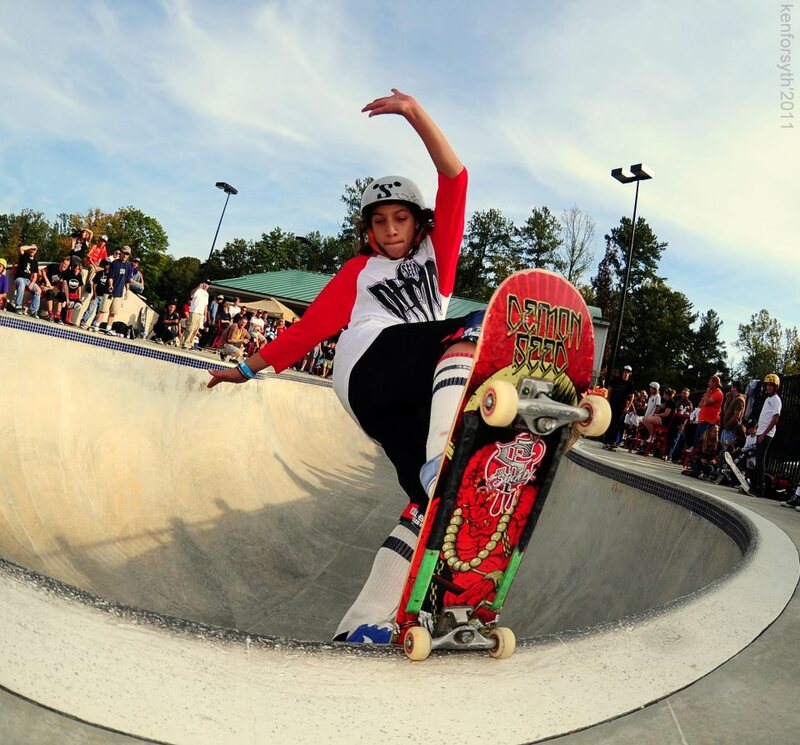 skater, Juan Pineiro "enough said", Isaac Crawford good friend & good skater, Jacob "POP TART" Welch shreds the gnard period! 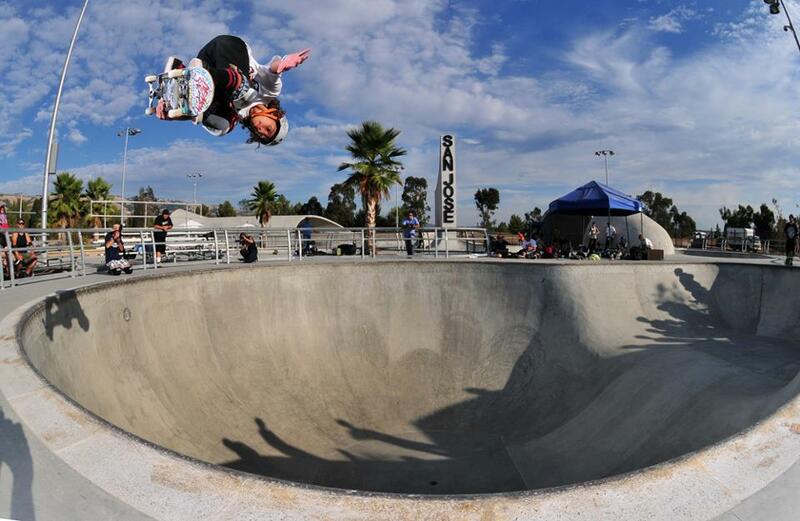 Ashton Dohany good vert skater & Little super star Christian Frazier kills any bowl. isTia.tv: Who are you other sponsors? Steven Pineiro: Demon Seed, Tork Trux, 187 Killer Pads, Type S Wheels & Aqua East Surf & skate Shop. isTia.tv: Goals for 2012? Steven Pineiro: To Stay Healthy, To travel ,go to as many events I can, skate good, meet tons of people & have fun all over the world. isTia.tv: Something else? Steven Pineiro: Just want to give shout out to all my sponsors, friends, fans & family but especially to Wade for believing & living The dream with me!!! God bless you all! !